A Long Bob with Bangs is an easy solution to bring life to the lifeless and boring locks in a quick way. Because of the impure hair care products, thin or super thick texture of hair, manes start lacking the necessary movement and fun they should possess. In such a situation, the haircut that helps to showcase the hair in more fun looking way is required to bring back the charm in the personality. Bangs not only make the hair more appealing but also add lift in fine hair. 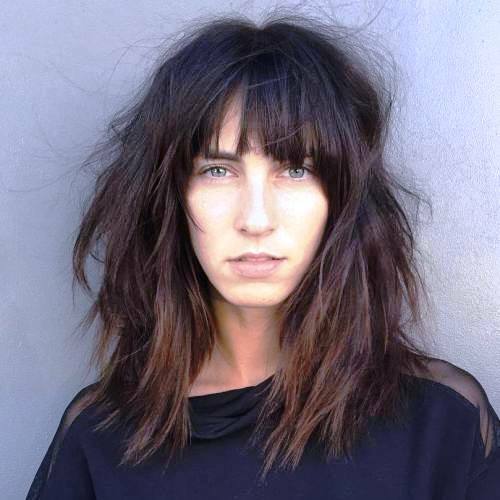 By incorporating layers with bangs, one can also remove heaviness from the thick locks. Hence, all hair textures are transformed easily as per one’s choice and demand. Some of them are easy to style, while others are super glam. So, have a look at some of the striking styling options we have exclusively collected for you. There are endless opportunities to try and get a refreshing look to get an impactful and unique style statement for you! No doubt, bangs are responsible for adding tons of movement in flat manes. 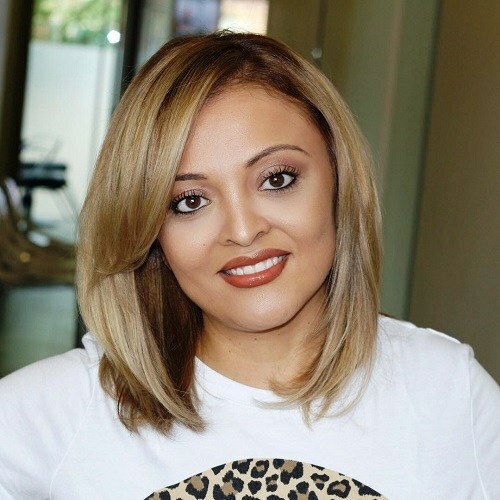 The highlight of this airy and light Long Bob with Bangs is the cool and sophisticated color. There was a time when young girls resisted choosing the whitish gray color. As it was meant to be only for aged ladies. However, the styling world has changed its standards in this modern era. 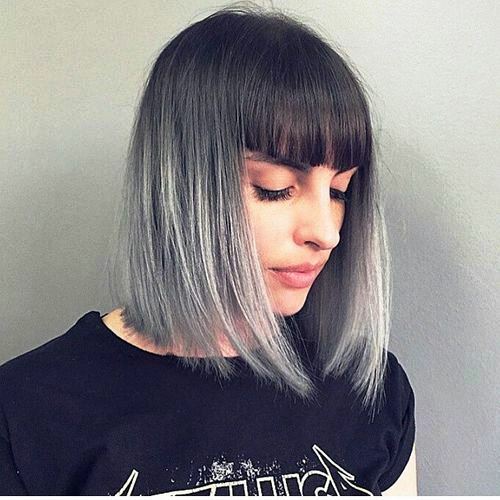 Wearing a bob with long side bangs having whitish gray highlights is definitely a great way to get attention. Keep it side-parted to get a flowy one-sided view. 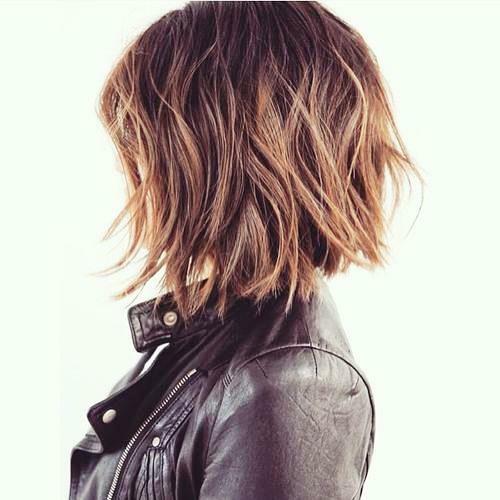 A bold hair dye along with a super edgy cut… these are the highlights of this messy Long Bob with Bangs Hairstyle. It suits well for the ladies with naturally wavy or curly hair. The cool hair dye such as of red or maroon color makes it eye-catching and flattering. The stylist will incorporate the layers with tousled styled bangs, making this cut funky and stylish. Use a curling rod to pronounce the natural wavy texture of your hair. Furthermore, a salt serum will reduce the heating damage. Wear it with a dark lipstick and you are all set to steal the show! Super sleek styles are so much in trend these days, and one good example of it is this collarbone angled Long Bob with Bangs. It creates a sophisticated look which is adorable. The best part of this cut is that it is edgy and sharp, but not too proactive. The front manes cut till the eyebrows help you to get an angelic baby look, which balances the sharpness of the angled bottom. Go for a dark hue like jet black or dark brown as it complements the style well. Hence, it is a super stylish yet sophisticated look for all professional ladies out there! A bob is a nice way of getting voluminous and thickness illusion in thin and fine hair. A blend of bangs and choppy layers go ahead to generate a dynamic and a full-bodied look which is quite adorable. Keep the hair hue lighter to soften the overall image. Furthermore, keep it a bit tousled while styling to make it edgier. Therefore, this combo of movement and softness makes this one of the cutest Long Bob with Bangs hairdo for fine hair. 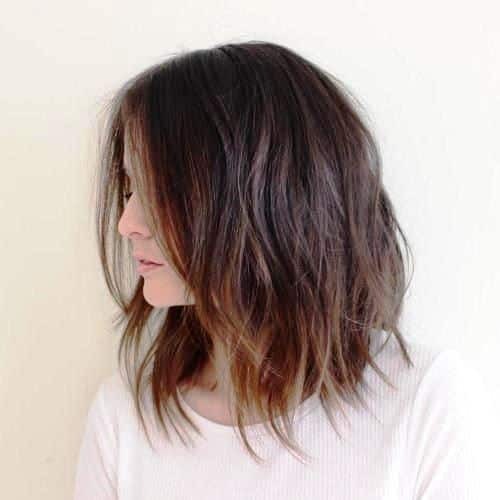 This one is a fine inspiration if you are looking for some latest Long Bob with Bangs cuts. Many of the girls having wavy texture hair, search for ways to get it either sleek or curly. However, the wavy texture has its own worth, and it looks stunning when styled properly. This messy bob shows us how to get an adorable appearance without changing the natural texture of hair. 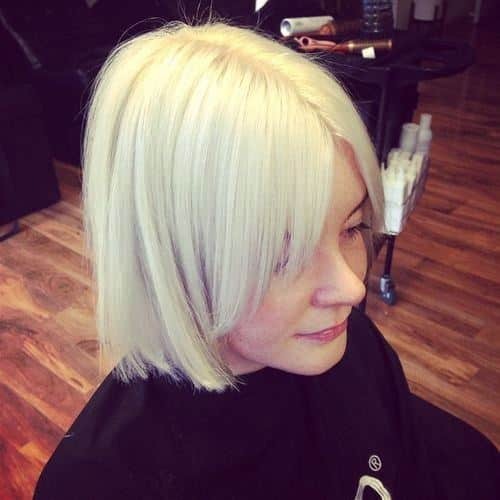 Light blonde color dye further adds a cuteness factor to the perfectly cut bob. Only a mascara along with this cut is enough to let the heads turn towards you! This Long Bob with Bangs instantly adds movement and dimension in too limp and flat looking thin hair. Most of the featured haircuts for fine hair contain bangs in one form or another. As they provide texture and dimension to manes in an effortless way. Here, the layers are not introduced, instead, the style is kept simple by picking a single length cutting. Only the bangs and dye selection will do the rest of the job of bringing a fun factor to the whole look. Go for a blonde base hue and add red streaks randomly to get a more alluring look, which is heart winning. 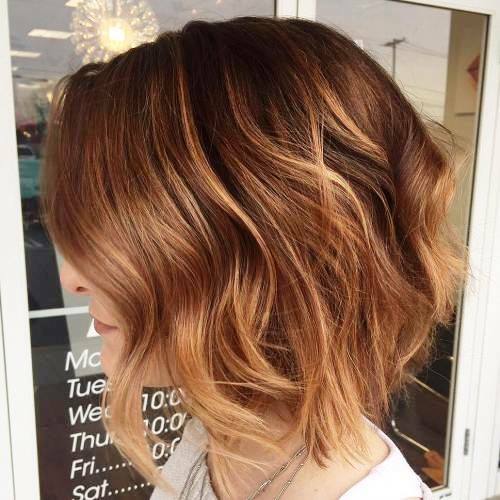 This bob creates a pretty and bouncy look with full of dimension and movement in no time! A Long Bob with Bangs is a way versatile than its other competitor hairstyles. As bangs are responsible for interesting movement and dimension which is the highlight of such hairdos. Some may think of that the bangs are a burden as the manes have to be on the face all the time. However, the dynamic factor they introduce to dull looking manes makes them worth it. Moreover, they are easier to style than any other cut. Without using many accessories such as Bobby pins, clips, etc. one can get a voluminous and alluring look! One of the highlights of Long Bob with Bangs is that they are edgy as well as chic and adorable at the same time. Keep the locks till the shoulders. Add layers of different lengths to get an edgy appearance. Choose a cool hair dye such as blonde. To get it more dramatic, keep the roots a bit darker to get a dual-toned look, which makes you look more alluring. Don’t use so much hairspray, instead, wear the manes in messy form to communicate carefree vibes. Get a good quality to get a shine, which is compulsory to wear the locks free. Platinum is a current sensation of the era. However, this dye is quite hard to pull off, mainly because this light tone highlights even small cutting or styling imperfections. The choppy Long Bob with Bangs is an effortless trick to wear the platinum color in an elegant way. Add lots of bangs on both the sides of the crown to make it catchy. 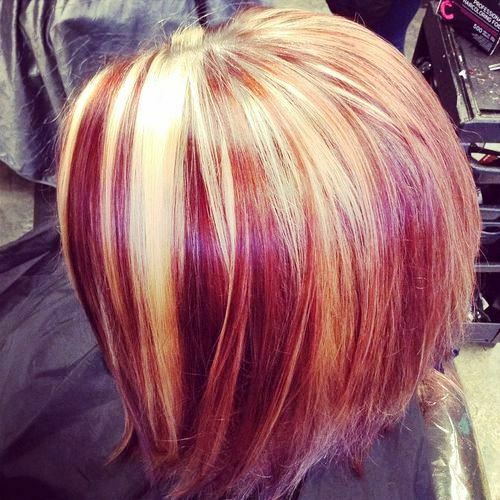 The side-parted layered style complements platinum, one of the boldest colors of the styling town. 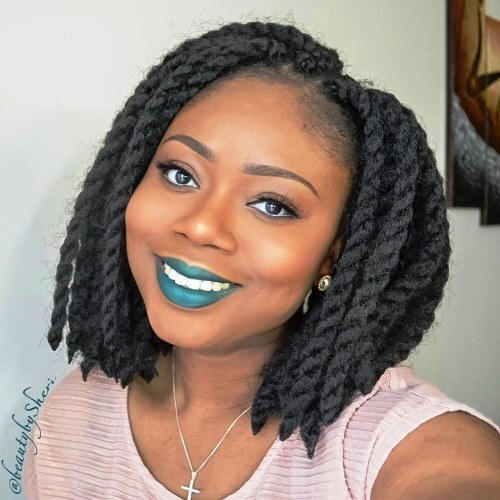 The end result is an easy breezy look with so much fun! Pair it with a nose pin to get it more glorified. This is an interesting and funky voluminous hairdo for ladies coping with the thin hair problem. 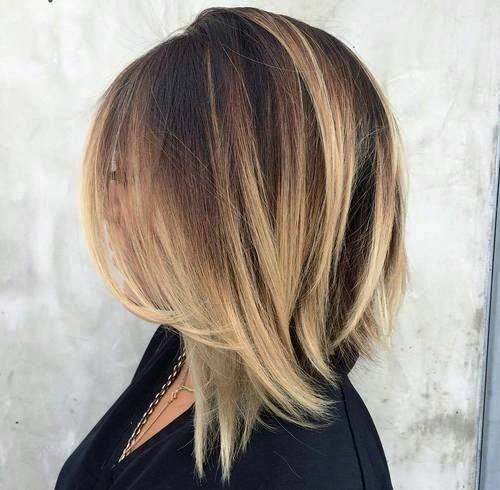 The eye-catching part of this Long Bob with Bangs is the cool color it has. Such high contrast dye with faded roots generate an absolutely stunning image, which will make sure you grab the attention of the audience. Side-parted bangs soften the sharpness of the cut, making it a pure feminine choice! Bangs instantly transform the traditional bob into a fashionable and edgy cut! The hair is kept super sleek in this one of the cutest yet glamorous Long Bob with Bangs. The side-parted bangs create a beautiful face-framing effect. Get your hands on a pure solid color such as jet black, blue, brown, etc. As the dark hues make such cuts more expressive than ever before. It creates an incredibly polished look, which let you be the center of attention in all events around! This one is a genuinely stand out Long Bob with Bangs, creating a dramatic and feminine image! It features an asymmetrical cutting style along with side-swept bangs having two different tones. A striking color combination of black and brown is selected to rock this super glam style. Blow drying technique is used to get an extra ounce of uplift to the top bangs. Hence, a lot of height on the top creates an elongating effect for ladies with round faces. The rest of the manes are rolled in a single go with a heating rod. Although women of all ages and skin tones can wear it. However, the black beauties rock this style in the best way possible as the style complements the skin tone very well! 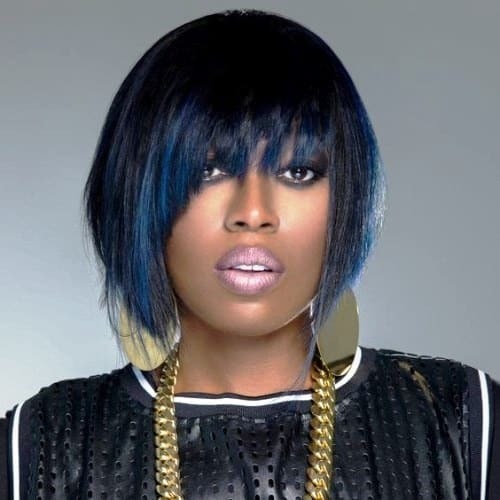 Many of the Long Bob with Bangs haircuts play with the color dye to get a unique look every time. 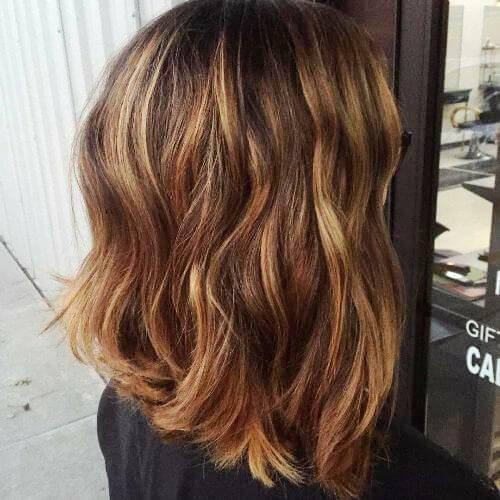 Here, Balayage color is used, which is considered as one of the brightest hues in the hairstyling industry. Dip your strands in an ombre Balayage to get a striking look, which is heart-winning. 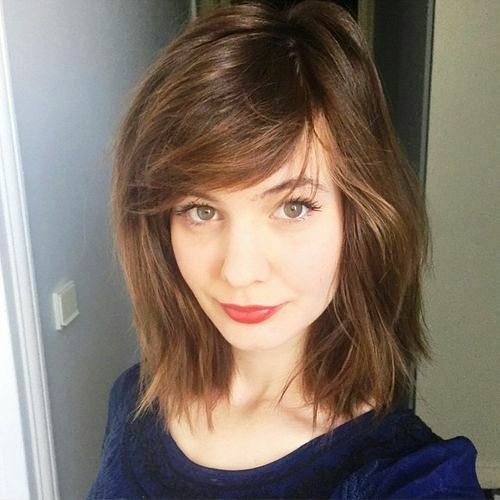 The blend of top bangs and bottom layers form a beautiful combination. Get few blonde streaks randomly to add a fun factor. Also, pronounce the natural waves of your manes to get a finishing touch in your style. This Long Bob with Bangs has created a pretty angelic look, isn’t it? A layered bob is a traditional yet classy and timeless choice when it comes to dealing with thin and fine hair. Here, the side bangs further add a youthful and fresh element to the overall style. Light blonde highlights with a bit darker roots go well with the cut. 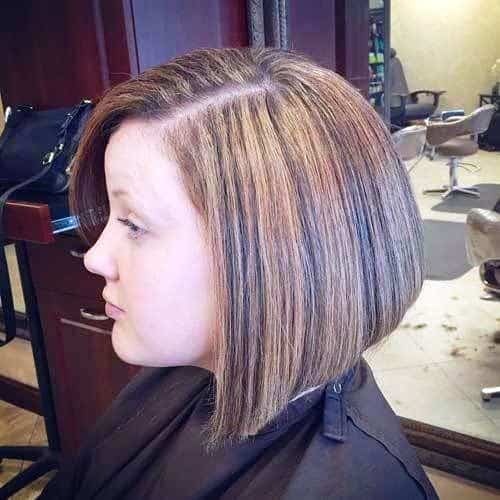 And the last but not the least plus point of this Long Layered Bob with Bangs is, it requires very little styling efforts and still allow you to earn maximum points on the styling chart! This elegant Long Bob with Bangs is a chic pick for ladies who want to remove heaviness from their long and super thick locks. When properly handled, a graduated long bob makes a crown appearance on the top of the head. The manes touching the shoulders create a fun loving and sophisticated look. One can feather the ends to get a messy and carefree vibe. Go for a solid color dye, matching your natural hair color. The front layers frame the face beautifully and make you convey soft vibes rather than edgy ones. The end result is absolutely alluring and appealing look! This simple yet glamorous style is a hot trend these days! Use of babylights and highlights create a feminine image, which is really alluring. The side bangs add texture to the naturally wavy hair of yours. With this cut, strands appear fresher and healthier than ever before! Choose a caramel hue to brighten your complexion and get a stylish and trendy look in no time! This side parted bob with jet black bangs will make everyone scream “Cool”. 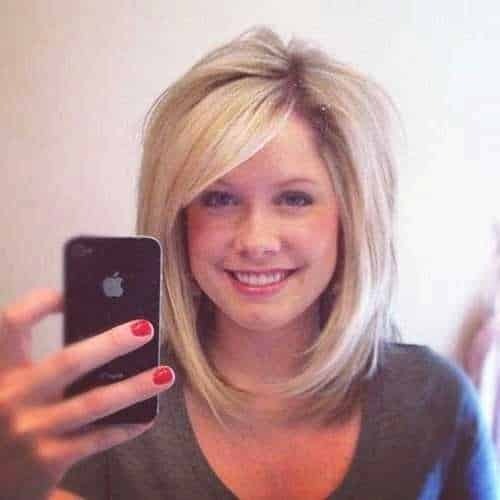 Such Long Bob with Side Bangs cut is easy to style, maintain and are really adorable and seductive. Thanks go to the soft, loose waves and elegant fringes. Keep it a little messy while styling. As in the messy state, still, it creates a sophisticated and polished look which will never go unnoticed! To convert the flat and boring locks into the manes full of movement and dimension is the dream of every girl. The hairstyle is the most important factor that shapes a girl’s personality. So, think again before getting your next chop whether you are getting a right cut or not! 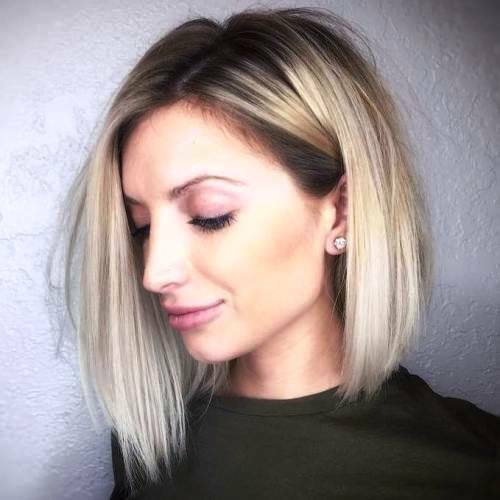 Long Bob with Bangs is a great way to add tons of drama, fun, movement, dimension, and flow to the manes without overdoing it. Such styles look alluring to women of almost all face shapes, skin tones, and hair textures.